For over 10 years, Southland Integrated Services, Inc. (formerly known as Vietnamese Community of Orange County) has helped more than 10,000 Vietnamese refugees and immigrants to become naturalized American citizens by providing them free citizenship training classes and guiding them through the application process. Southland also assists Vietnamese-American citizens in filling out immigration forms or making petition for relatives. We provide translated materials and friendly bilingual service to make the process less daunting. Citizenship training classes are provided weekly at our Santa Ana location on Saturday from 9 a.m. to 12 p.m. For more details on how to register for the class, please contact (714) 620-7000. Every second Friday of the month, Southland receives a small distribution of food from the Orange County Food Bank and distributes these canned goods and packaged foods to the community based on individual and/or family needs. Participants must bring their ID for food pick-up at our Main Office location. The weekly basis class is designed to improve the mobility for seniors. Through participating in this fun environment, seniors will have a chance to meet, socialize, and practice line dancing with other seniors. The activity will decrease the chance of getting Alzheimer’s disease, improve the blood circulation, and enhance a healthy body and lifestyle. The class will meet 3 times per week on Monday, Wednesday, and Friday from 9:30 a.m. to 11:30 p.m. Participants does not need to have any pre-dancing skills. For more information, please call us at (714) 620-7000. The program was developed to provide Seniors with access to non-emergency medical appointments and including but not limited to dialysis, therapy, dentistry, prescription pick-ups, lab tests, x-rays, etc. Participants must be at least 60 years of age or older and reside in our service areas (Fountain Valley, Midway City, Garden Grove, Santa Ana, Stanton, and Westminster) and there is a $2.00 donation fee per trip. Interested participants must call (714) 620-7000 or (714) 558-3097 at least 5 days before the trip to schedule an appointment. Please note that calling in advance does not guarantee an appointment. 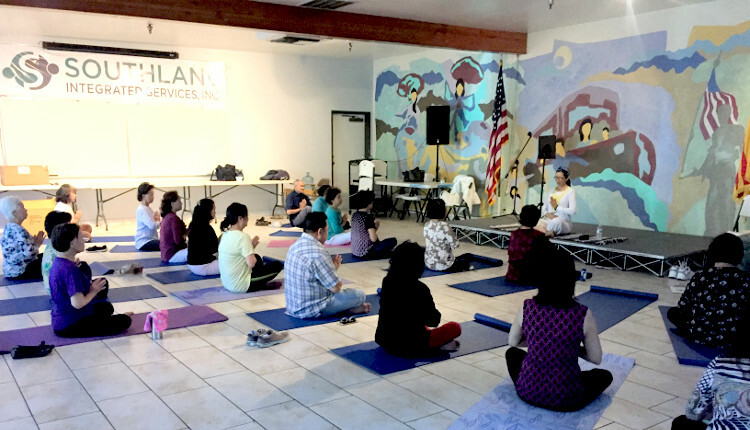 On every last Monday of the month, Southland Integrated Services is pleased to provide one hour yoga session our Main office located in Santa Ana. All classes are free for anyone to attend. The classes are facilitated by yoga instructor Cattien Tran who is KRI certified. Some mats are provided. Bring your own mat if you can. Just wear comfortable clothing. People who would like to attend are recommended to have only light snacks 2-3 hours prior to yoga class. For more details about the class and to enroll, please call (714) 592-8639. Since telephone bills can be overwhelming for both English-speaking and non-English-speaking consumers in the community, the Program is designed to guide the consumers through the matrix of telephone bills. The purpose is to remove non-essential, un-necessary, yet expensive options from the consumer’s telephone account, thus will help to lower the overall monthly telephone expense. For more details on the program qualifications, please contact (714)620-7062. The program provide services to Limited English Proficiency and underserved communities through outreach, consumer education workshops, and dispute resolution services involving gas and electricity utilities.